← Policy Debacle: Do we know how to implement climate policy? The University of Victoria in Victoria, Canada, established a system of weather stations located at schools across the greater Victoria region and is in the process of expanding the system to include schools across Vancouver Island (http://www.victoriaweather.ca/). The system has been a media relations coup, with television stations able to provide viewers with real-time temperature readings from a school located close to where they live. The network of stations also provides students at all grade levels (and into university) the opportunity to study vast amounts of temperature, precipitation, wind speed, wind direction, and other information over space and time. The amount of data available is now truly impressive. The data from the system of weather stations do provide the opportunity to examine issues of measurement that plague climate scientists in ‘constructing’ regional or global averages of temperature. One of the problems is that of removing socioeconomic effects (e.g., economic development, population growth), because a failure to do so confounds the relationship between CO2 emissions and changes in temperature. For example, if one weather station is impacted by a heat source and another is not, this will cause the average of the two stations’ temperatures to be higher than it should be. A weather station located in a rural area may increasingly become surrounded by developments until, finally, it is located in what is essentially an urban area. The temperature readings at the station will exhibit an overall upward trend over time, but this is due to increasing economic activity and not a result of factors that cause global warming. The same is true of any weather station located where surrounding economic activity increases over time. How do scientists remove these non-climate effects from their temperature data series? How do they ‘homogenize’ the temperature data? The difficulty facing climate scientists in their efforts to homogenize temperature data can be illustrated using temperature records for 2010 from just two schools in the Victoria Weather Network system. Gordon Head Middle School and Lambrick Park High School were chosen because they each have a weather station and because they are located very close to each other, perhaps separated by 200 meters of open space (as indicated in the first photo). One would expect the temperature readings at the two schools to vary by only a small amount, with the difference negative on some occasions and positive on others. The locations of the weather stations on each of the schools are indicated in the photos. Ideally, weather stations should be located in open fields away from anything that might affect temperatures, whether an air conditioning unit that emits heat to the outside as it cools the inside of a building, an exhaust pipe that emits heat, or a building or parking lot that absorbs the sun’s energy and then radiates energy back into the atmosphere thereby providing higher than warranted temperature readings. It is difficult or impossible to maintain a weather station that is unaffected by development over a long period of time. However, it would make sense that, when installing new weather stations, particular care is taken to avoid easily identifiable socioeconomic sources of weather interference. It is clear from the photos that the weather station at Gordon Head School, although not ideally located as heat absorbed by the roof and other surroundings will affect temperature readings, is likely the best one can do given there is no open space that might be free of interference from recreational users (including students) and free of potential vandalism. This is not the case for the weather station at Lambrick Park School. The weather station is clearly located near several heat sources – exhaust pipes for the school’s heating system and machinery from the wood working shop (which is perhaps the largest of its kind in the entire region). The problem could easily have been solved by placing the weather station on the northeast or northwest corner of the school, but this might have caused other problems due to the nearness of a parking lot and a hill on the west side of the school. When installing the weather stations, the University of Victoria researchers “try to find open, unobstructed locations so that our measurements are not affected by the presence of obstacles such as trees, telephone poles, chimneys, vents etc.” (www.victoriaweather.ca/installphotos.php). According to UVic researchers, in the case of the Lambrick Park School, the weather station was placed above the wood working shop at the request of a teacher. One can think of several hypotheses that can be tested using data from the Victoria Weather Network. 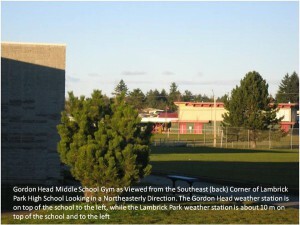 There should be a consistent difference between the readings at Lambrick Park High School and Gordon Head Middle School, with the former readings consistently higher than the latter. 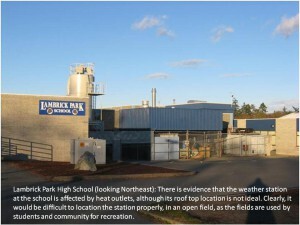 The reason for this is related to the effect that extraneous factors, such as exhaust vents, have on temperature readings at Lambrick Park School. Again, this is related to the extraneous influences at Lambrick Park School. In the first figure, the average daily temperature at Gordon Head School is subtracted from the average daily temperature at Lambrick Park School. The temperature difference is always non-negative, varying from a low of zero to one degree Celsius, with a difference in average daily temperature of 0.36oC. These differences are not insignificant given temperature changes of 0.3oC are projected by climate models to require as many as two decades to realize under continued increase in atmospheric CO2 concentrations. Clearly, the temperatures at Lambrick Park School are affected by activities, such as the state-of-the-art woodworking shop located next to and below the weather station and heating vents. 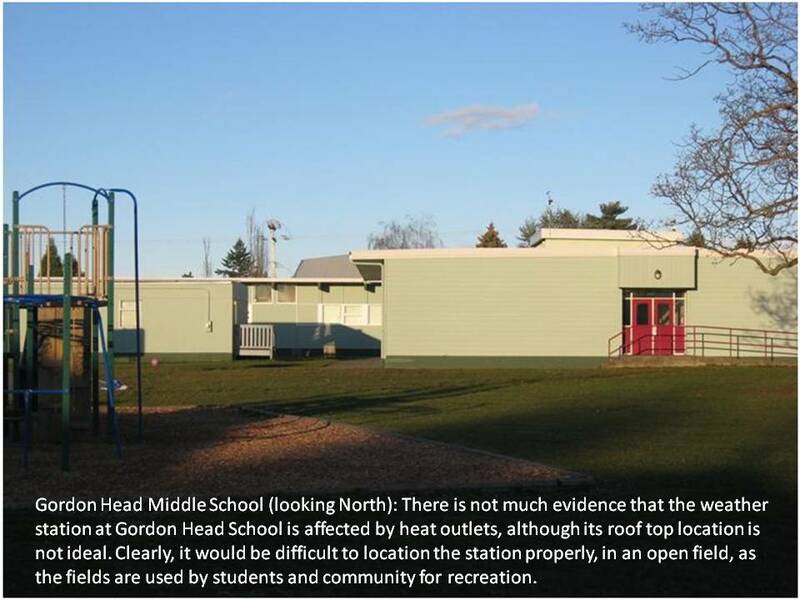 The weather station at Gordon Head School is not similarly impacted. Thus, our first hypothesis is confirmed. In the second figure, the daily maximum (minimum) temperature at Gordon Head School is subtracted from the daily maximum (minimum) temperature at Lambrick Park School. The average difference in daily maximum temperatures is 0.28oC, while the average difference in daily maximum temperatures is 0.63oC. Further, the largest difference in daily maximum temperatures is 2.7oC, while it is 1.3oC for daily minimum temperatures. Surprisingly, there are a few days when the maximum temperature is highest at Gordon Head School (at most by only 0.3oC) and so is the minimum temperature (at most by 0.2oC), but not on the same days. Notice that the difference between maximum (daytime) daily temperatures is greater than the difference between nighttime temperatures, and that, at certain times of year, there is little difference in the temperatures between the two weather stations. This provides support for the second hypothesis above, further confirming the existence of non-climate effects on temperature. Suppose that, given the temperature readings at Gordon Head School and Lambrick Park School, one wished to find an average (aggregated) temperature for the region. One could take a simple average of the two temperature readings, but it would bias the average upwards because one of the readings is affected by heating vents, etc. One could attempt to adjust for this by bringing in information about when the schools are used, each school’s student population, the energy use at each school, and so on. However, no matter how one adjusts the temperatures, the influence of the heating vents cannot be eliminated entirely. Indeed, assuming that the temperature reading at Gordon Head School is not in any way contaminated, the best measure of the temperature in the region surrounding the two schools is simply given by the temperature at Gordon Head School. That is, the temperature readings at Lambrick Park School should simply be ignored. In the above example, we have good information on the temperature readings we want to aggregate. In practice, climate scientists must aggregate temperature readings from thousands of weather stations scattered around the globe, but not uniformly. With some notable exceptions, little is known about the various nuances characterizing weather stations and the readings they have provided over many years. Given that we cannot eliminate the effect of heating vents in averaging the temperatures of two schools (except by ignoring one of them), how can we expect scientists to construct temperature averages from thousands of weather stations that are nonetheless free of the effects of non-climate factors – free of contamination. Scientists associated with the IPCC process claim to have constructed temperature series that have removed non-climate factors from the instrumental (observed) record. Scientists at NASA’s Goddard Institute for Space Studies and the National Oceanic and Atmospheric Administration (NOAA) in the United States, and at the Climate Research Unit at the University of East Anglia in the UK, have separately developed temperature records that go back as far as the mid to late 1800s. These are purported to demonstrate that rising temperatures are the result of greenhouse gases in the atmosphere. Each group selects a subset of the available weather station data and applies its own adjustments to remove non-climate contamination. Researchers from the University of California at Berkeley under the guidance of Dr. Richard Muller have recently taken another look at the data available from global weather stations. They use the most advanced statistical methods to analyze all the available temperature data, regardless of its quality. The Berkeley effort is considered by many to be the penultimate approach, which will either confirm or refute the previous work on temperature trends during the 20th Century. However, there is no reason to expect that the Berkeley reconstruction of global average temperatures will come to a different conclusion than the series provided by NASA, NOAA and CRU. After all, the data sources are the same in each case – instrumental records from weather stations. Only the choice of weather stations and methods used to average temperatures differ. It is unlikely that the Berkeley group will be able to entirely remove the effect of non-climate factors. As indicted in our discussion of the readings at the two Victoria schools, any adjustments to the data are ad hoc at best. McKitrick and Michaels (2004, 2007), and de Laat and Maurellis (2004, 2006), have clearly demonstrated that attempts to remove the non-climatic signal have not succeeded. These authors found that about 50 percent of the rise in temperatures reported by climate scientists relying of measurements from weather stations is attributable to socioeconomic, non-climate activities. This work has been criticized by IPCC scientists (IPCC 2007, p.244), but, in my mind, the most convincing evidence of contamination in the weather station data has recently been demonstrated by McKitrick and Nierenberg (2011). Regardless of the statistical tests they performed or explanatory variables that they added to address concerns by climate scientists, the authors found the effect of socioeconomic variables on temperature trends to be extremely robust for the NASA and CRU land surface temperature products. But the real proof of contamination came when satellite data and (back-cast) data from an ensemble of climate models for the same period were substituted for the NASA and CRU temperature data. With the satellite and climate model temperature data, the statistical significance of the socioeconomic, non-climatic factors disappeared! The satellite and climate model data did not exhibit any socioeconomic bias. This research clearly indicates that temperature aggregates based on weather station data are unreliable as a guide for attributing any rise in average global temperatures solely to greenhouse gas emissions. De Laat, A.T.J. and A.N. Maurellis, 2004. Industrial CO2 Emissions as a Proxy for Anthropogenic Influence on Lower Tropospheric Temperature Trends, Geophysical Research Letters 31, L05204, doi:10.1029/2003GL019024. De Laat, A.T.J. and A.N. Maurellis, 2006. Evidence for Influence of Anthropogenic Surface Processes on Lower Tropospheric and Surface Temperature Trends, International Journal of Climatology 26: 897-913. IPCC, 2007. Climate Change 2007. The Physical Science Basis. Working Group I Contribution to the Fourth Assessment Report of the Intergovernmental Panel on Climate Change. Cambridge, UK: Cambridge University Press. McKitrick, R.R. and P.J. Michaels, 2004. A Test of Corrections for Extraneous Signals in Gridded Surface Temperature Data, Climate Research 26: 159-173. McKitrick, R.R. and P.J. Michaels, 2007. Quantifying the Influence of Anthropogenic Surface Processes and Inhomogeneities on Gridded Global Climate Data, Journal of Geophysical Research 112: D24S09, doi:10.1029/2007JD008465. McKitrick, R. and N. Nierenberg, 2011. Socioeconomic Patterns in Climate Data, Journal of Economic and Social Measurement 35(3-4): 149-175.